The heavyweight contest between Robert Helenius (27–2) and Yuri Bykhautsou (10–17–3) started with a bang as Helenius seemed to hurt Bykhautsou with the first shot he threw. The Belarusian welcomed the challenge and proceeded to attack Helenius vigorously for the next six rounds. 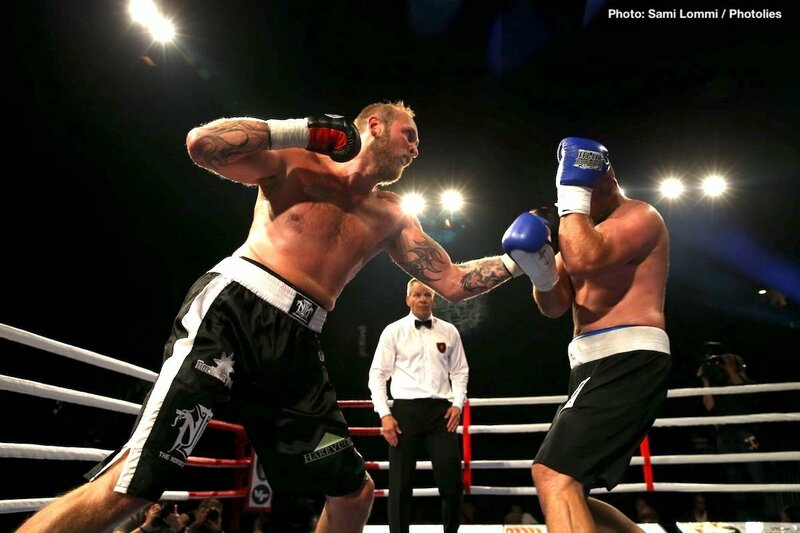 Helenius’s game plan was clear: het let Bykhautsou attack, countered with uppercuts and right hooks and then clinched. This proved to be an effective strategy, though often Bykhautsou caught the taller Finn with savage hooks to the head. Helenius’s shots seemed to have little effect on the charging Belarusian, whose chin proved once again to be very solid. In the sixth and final round Helenius got in some shots that finally seemed to do damage. They were not enough for KO and the fight went to the scorecards. Helenius was rewarded with a unanimous decision. The undercard featured several cracking fights. An eight-round featherweight contest between Jose Antonio Sanchez Romero (9–0–1) and Jose Hernandez (4–27–1) was a tough fight as Hernandez chased the taller Romero, who answered with jabs, one-twos and left hooks to the body. Romero stayed in charge and got the UD, but Hernandez proved to be one tough customer. Welterweight Oskari Metz (8–0) faced an equally tough Nicaraguan Miguel Aguilar (11–46–1), whose hard hooks forced the Finn to keep his guard up. Round by round Metz started to take control more firmly, and though Metz attempted to score a KO in the sixth, Aguilar made it to the end and Metz had to settle for an unanimous decision. Nourdeen Toure (8–2) scored a TKO victory over Isaac Benitez (0–4–1) in a light welterweight contest. The referee stopped this one a bit too early. The event started with four amateur boxing matches. In middleweight fights Malik Karadag edged a victory over Ilari Kujala and Muhammad Abdilrasoon won Santeri Laine. Heavyweight Krenar Aliu controlled the action against Lucian Kühne and lightweight Arslan Khataev secured a win over Fidaim Brahimi.